Make your own soil amendments for free! Turn your yard scraps and household waste into next year's golden dirt. Let nature work for you, and enjoy the finest potting soil ever--free! 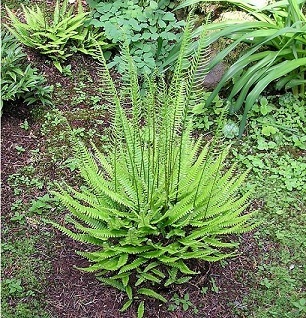 At right, possibly the world's happiest Deer Fern (Blechnum spicant) in a private Salem, Oregon, garden. It has grown it's whole life in composted soil. 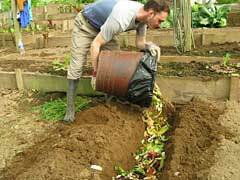 You can make your own soil booster by composting 'waste.' It is simply a matter of putting into a pile the garden trimmings and twigs, leaves from autumn, even scraps from your kitchen. 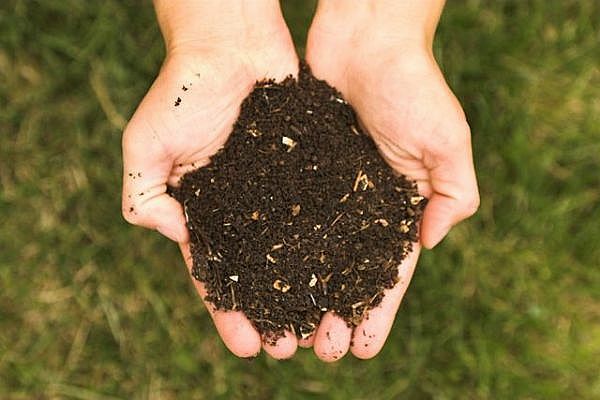 Dairy, meat and cooked food tend to draw varmints and may stink when composting so if you want to include these rich materials in your dirt-making, you will want to use a process specifically for them. 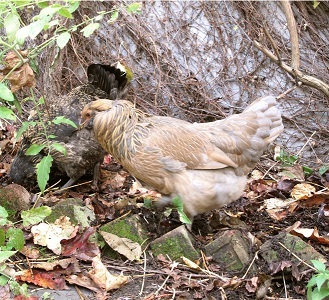 If left alone, the compost pile will yield, in about a year, beautiful stuff as good or better than you can buy. If you stir it up every once in a while, it will be ready to use in just a few months. If you use one of the high tech composters, you'll cut the time considerably, especially when the chemical composting preparations are utilized. 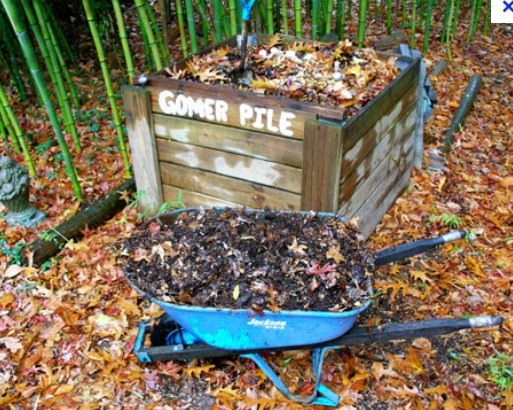 Making compost is one of the most rewarding and useful things a gardener can do. 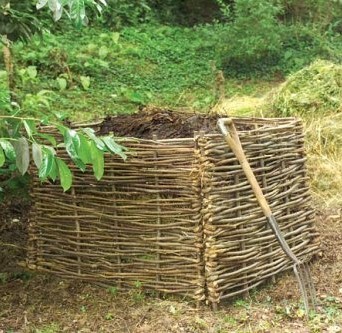 To take garden trimmings and grass clippings and branches and other debris from the garden and allow it to become rich compost is a true miracle of nature. It can be so simple to do! 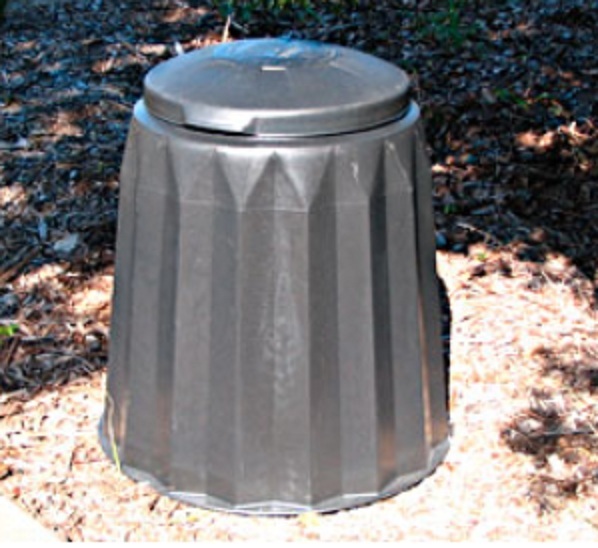 There are special composting bins that turn and ventilate and look snazzy in the landscape but a simple pile in a back corner of your yard will do just as well. It is not labor-intensive unless you feel inclined to turn it periodically. If you're in a hurry to make some compost you should turn it and attend it and generally baby it along. But if you want this fall's debris to turn into rich, dark humus for next spring you can just leave the pile be after it's built. Ah, but that's where the artistry comes in: building the pile. 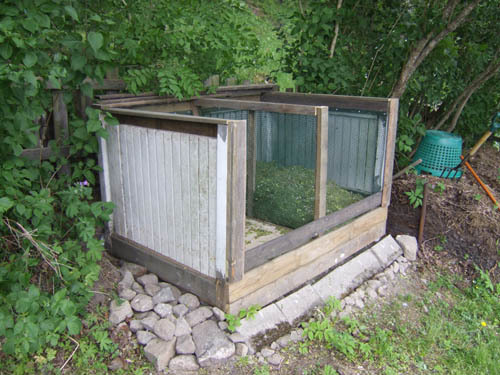 You can do this in an enclosure of some sort (see examples below) or just in an unused corner of the garden. If your yard has one of those skinny spaces between your property line and your house or another building, this can be a good way to put that dead space to productive use. Sunshine is the only environmental necessity. Start with that spot in the back corner where nothing much is going on and arrange some branches on the ground to form sort of a platform to allow air to circulate. Nothing fancy, just a pile of branches and twigs will do fine. Then layer on the materials--browns and greens (see below for ingredient list)--until you have used everything for the pile. Then water thoroughly (but not soggy) and loosely cover the top only. Covering can be a tarp or a piece of plywood or old door or whatever you have handy. One of my favorites is a patio umbrella that lost it's pole. It's lovely to look at and does the job quite well of protecting the pile from the weather. You see, air must be able to circulate through the sides but the top has to be covered so the rain and snow won't ruin the cooking. The cover also aids in building the heat in the pile. 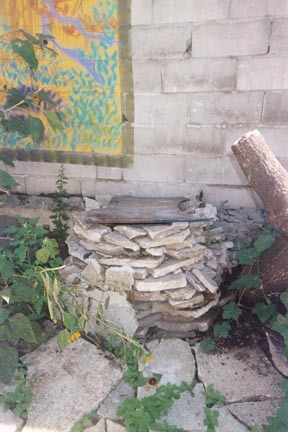 What happens when you have a properly built pile is the materials work together to actually cook the debris which breaks down the pieces into their basic elements. When the pile is done it's dark and rich and better than anything you can buy. And it's free! So, once your twigs and branches are placed on the bare ground, start layering the greens and browns, water the pile, cover the top and wait until spring! Paper--glossy paper with colored ink unless it is soy based ink. Cowpies may have E coli--bad and can be deadly. For those who want compost faster and more fully mixed, there are many tools made specially for this purpose. The first one at right is called Yard Butler and has two flippers which fold up when plunged into the pile and come down when it is raised, stirring the pile from bottom to top. The second one at right is the Double Winged Metal Pile Turner and Compost Aerator. It has similar flippers as the first one but goes farther with a drill-type pointed end and a second handle for added ease in using. If you have a two or three sectioned bin, you can use a digging fork or pitch fork to lift material from the first bin to the second, turning bottoms up as you go. A third section can hold buckets of greens and browns to be added alternately. http://velonet.org/ribs/get-involved/private-programs/ RIBs is collaborating with Cooperative Extension to design a fun and interactive compost turning apparatus. The finished product will be a pedal powered compost turner that will be permanently installed in the new plot of land near the farmers market. With the help of local welders, engineers and mechanics, we will be building this stationary tandem bicycle from donated bike parts. An alternative to manual mixing is the tumbling or rotating style of bin. There are many designs available. They have a platform of some sort to allow movement. Some have a crank that is either manual or motor driven. Others just rotate in their stand. They come in varying sizes. In this case, bigger is better because more materials can be loaded, allowing a more varied mixture of nutrients=more balanced product. They most always cost more than ready-made stationary bins. They usually have a bigger footprint than stationary bins--they take up more space and require some distance from fencing or walls so that the handle or crank is reachable. They do not blend into the landscape as well as stationary kinds. They may or may not work more efficiently or quicker than other types. Besides the two examples of commercially built tumbling bins, another design is very economical, easy to set up and fun for the family (especially the kids). 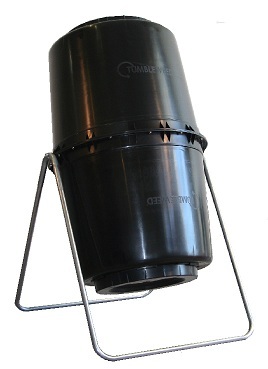 A barrel composter is simply a clean, food grade barrel with a tight fitting lid and holes here and there. 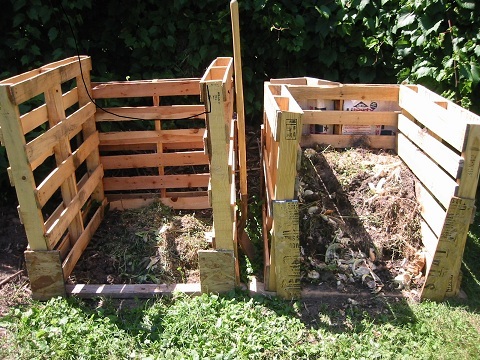 Put in the compostables, clamp on the lid, turn on its side and roll around the yard/garden. Some folks claim the barrel must be turned the same direction all the time, but personally I do not see the point of that. 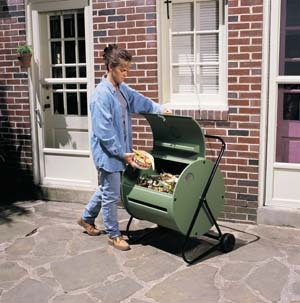 This composter is obviously simple to move from one spot to another. Good barrels for this application can be had surprisingly cheap or even free. Retail prices range from $10 - $100 for 55 or more gallon barrels. Rain barrels, pickle barrels, barrels that originally held grain, all are good candidates. The trick is this: this type of barrel is useless to hold rain or pickles or whatever when they crack or get holes in them so they are often discarded. But they are perfect for composting. If you buy a new barrel, you have to make holes in it anyway. Look on www.freecycle.org or similar websites. This lovely white picket bin has a front section that can be lifted off for mucking about in the materials. This glamorous bin was built, obviously, by an artist. The painting on the wall sets off the layered shale stones beautifully. A wattle bin uses sticks from landscape trimmings to form a strong bin from waste material. When the bin itself finally gives up it can be composted in the next bin to come. If you don't want to wait for nature to get your compost going, there are many different kindss of stuff to get your composting off to a good start quickly. Ringer 3050 Compost Plus has a "blend of microorganisms with specially designed nutrient sources that start the compost process quickly and efficiently." Natural Industries LGDC0020 Decomp-9 Compost Booster Microbes contains "booster microbes." Homemade starters, according to various gardeners, include soda, dog food, beer, rabbit pellets, manure, urine, bone meal. One of the best boosters is oxygen. That's one of the reasons for turning and mixing, but you can also build in aeration by placing a layer of branches at the bottom of the pile. Then add other layers of branches every couple of feet. We're talking about branches bigger than 2 inches in diameter. Lay them down cross-hatch so they won't compact. Another way to get air into the bin is to put something about the size of a 3 gallon bucket in the center and layer compostables around it. The item can be an old wicker basket, wire waste container, wooden box with some gaps, even a rough oval of wire fencing with some sticks for a top--something that creates an air pocket in the midst of the pile.